The results will be presented in the Journal of Roman Archaeology. "These preliminary isotopic and mtDNA data provide tantalizing evidence that some of the people who lived and died at Vagnari were foreigners, and that they may have come to Vagnari from beyond the borders of the Roman Empire," says Prowse. "This research addresses broader issues relating to globalization, human mobility, identity, and diversity in Roman Italy." Based on her work in the region, she thinks the East Asian man, who lived sometime between the first to second centuries AD—the early Roman Empire—was a slave or worker on the site. His surviving grave goods consist of a single pot (which archaeologists used to date the burial). What's more, his burial was disturbed in antiquity and someone was buried on top of him. Prowse's team cannot say how recently he, or his ancestors, left East Asia: he could have made the journey alone, or his East Asian genes might have come from a distant maternal ancestor. However, the oxygen isotope evidence indicates that he was definitely not born in Italy and likely came here from elsewhere in the Roman Empire. During this era, Vagnari was an Imperial estate owned by the emperor in Rome and controlled by a local administrator. Workers were employed in industrial activities on the site, including iron smelting and tile production. These tiles were used for roofing buildings on the site and were also used as grave covers for the people buried in the cemetery. Fragmentary tiles found in and around Vagnari are marked "Gratus Caesaris", which translates into "slave of the emperor." 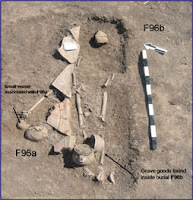 In addition to the mystery the find uncovers, Prowse sees the broader scientific impact for archaeologists, physical anthropologists, and classicists: The grave goods from this individual's burial gave no indication that he was foreign-born or of East Asian descent.